To become the first choice in retail display fixturing and custom woodworking by transforming our client's vision from design to reality. 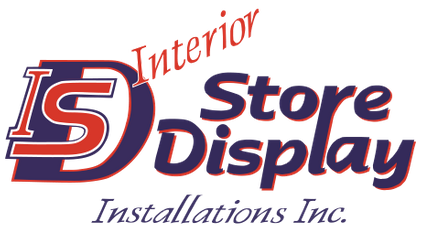 Interior Store Display Inc. is located in Kitchener, Ontario and has been servicing the commercial, institutional and industrial sectors from coast to coast for over 30 years. On April 1, 1986 Interior Store Display Installations Inc.’s good friends and founding partners, Jim McLellan and Peter Schulze got together to form a millwork installation company. They both at the time worked for a custom woodworking company called CMS of which both of their fathers were owners. CMS specialized in the designing and manufacturing of Store Fixtures and it was while Jim and Peter were working for their parents that they saw a good opportunity for them to branch off with a company that would complement the one that their fathers had established. The newly formed company, Interior Store Display Installations Inc., would specialize in the installation of store fixtures and at the beginning primarily for the Zellers and HBC chain of retail stores. Jim and Peter started doing business at Jim’s residence in Kitchener and by 1988 the work load grew to the point where they found it necessary to move into a single industrial bay unit on 196 McIntyre Drive in the Huron Business Park in Kitchener. It was while at this location that they started to branch out into not only the installation of store fixtures but also the design and manufacturing of them. Over the years and after much hard work and perseverance their operation continued to grow and so did their product lines and clientele list. In 1997 they found in necessary to move again into their current location at 64 Shoemaker Street in Kitchener and by 2005 the company had 25 plus employees, state of the art CNC equipment and a design department. Jim and Peter’s success was based on good old fashioned hard work and realizing that the customer comes first, back in a time when a hand shake meant everything and top quality products and customer service were normal and expected. Unfortunately and with much sadness we lost Jim on September 17, 2007 to brain cancer. Today thanks to Jim’s wife Lynn and his business partner Peter, Jim’s legacy, business philosophies, and company vision live on. We work hard to uphold Jim and Peter’s original vision and we strive each and every day to maintain that old school way of looking at the business-client relationship. We are proud of our history and we have assembled a strong team of highly skilled estimators, designers, manufacturing personnel and a network of professional millwork installers who are more than willing to help guide you with your project from initial concept to finished product. We will work with you during every step of the process to ensure a final product that will meet all of your expectations while not forgetting about your original budget and timeline. Jim and Peter’s old school business philosophies are the primary reasons for our success and our continued commitment to competitively priced, high-quality products and after sales support from days gone by.